I make no excuses for saying Rayman Legends on Wii U is in my top three platformers of all time. So imagine my delight and surprise to learn that members of the original development team split away to form Magic Design Studios and work on Nindies Showcase stealth drop, Unruly Heroes. Within three minutes of playing, the influences are clear for all to see. 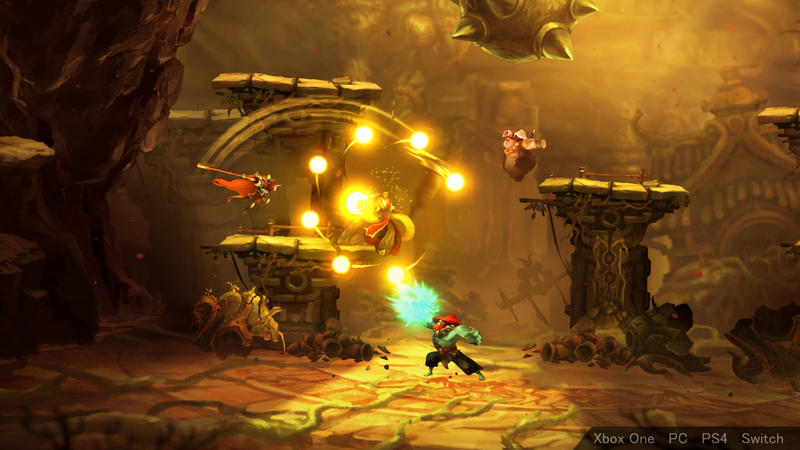 The vibrant colour palette, wildly animated characters and quirky personalities driving the game, along with the structure, and level design. 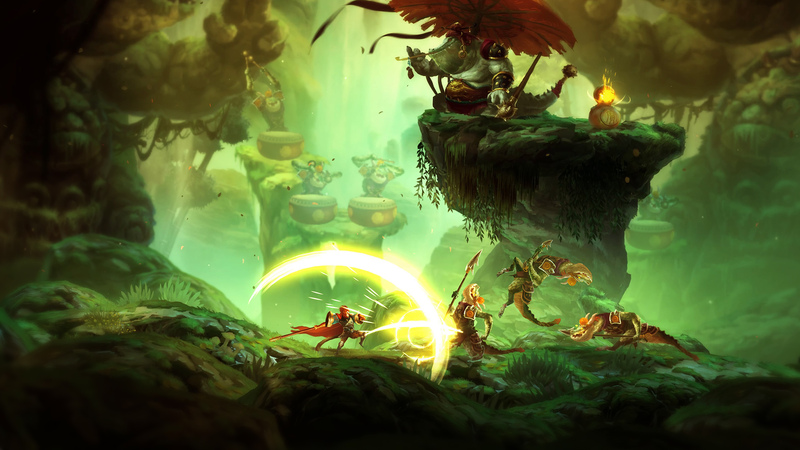 It’s definitely a game made by people who worked on Rayman Legends. And yet, Unruly Heroes is very much its own thing. This is a re-imagining of a classic piece of 16th Century Chinese literature called ‘Journey to the West’. The story is deeply entrenched in Chinese folk religion and mythology, with the characters taking a spiritual journey to meet gods and demons. 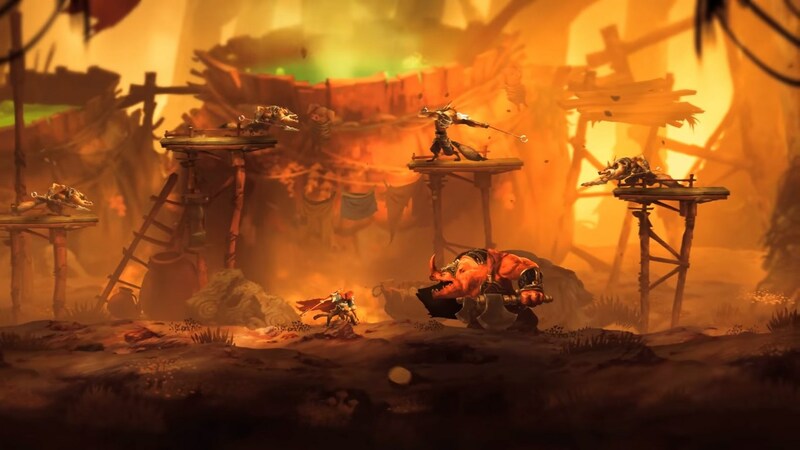 Where the Magic Design Studios effort differs from their Ubisoft pedigree is in taking some cues from the likes of Trine and The Lost Vikings. There are four unruly heroes to choose from, each one with different attributes which help them to solve different types of puzzles, and as you’d expect they’ve been based on the original source material. Tapping the Left Trigger, you can flick between the eclectic cast of Sanzang, Wukong, Kihong, and Sandmonk, working out how to use each one to solve the games’ unique puzzles so that you can fight back the forces of darkness and reclaim pieces of an ancient scroll. But the best part of it all? You can do it on your own or with the help of some friends. And it just works. The gameplay is fast and fluid enough that everything moves along seamlessly. Unruly Heroes art style is stunning and beautifully recreated, wonderfully infused with the charm and quality you’d expect from its inspirations. There’s even tons of neat secrets to find as you push through the 2.5D environments. I’m not entirely sold on the combat, though. While each character has different fighting abilities, strengths and weaknesses, generally it feels a little bit ropey. You’ll sometimes need to leapfrog the bad guys and do power slams from above. Other times you’re just hacking away at the B and X buttons, waiting to see who drops first. You do have light and heavy attacks, and some weapons work better against certain types of enemy, but it eventually does boil down to button mashing and becomes a tad repetitive as the skill-based fighting is usually reserved for the boss battles. You’ll also have to be careful to revive your teammates should any fall. To do this, you just pop a floating bubble close by and it’ll bring them back from the dead with a fraction of their health. Not the most effective way to do this, especially since it takes multiple attacks to even hit the thing and sometimes they float in inconvenient places. Fortunately, the game’s versatility really helps you look past some of the shortcomings. With lots of collectables, the option to buy new skins for your characters, and even PVP options, Unruly Heroes is a busy, content-rich platformer, that deserves a place on your wishlist. It may not have stolen the show during January’s Nindie Direct, but after spending a few hours mesmerised by its fantasy world, Unruly Heroes is way more fun than I ever expected. Experimenting with the different forms of puzzle solving – such as stretching out my staff as a make-shift bridge and turning into a piggy balloon that floats to the top of the screen – really breathes humour and purpose into these characters. This is a team unafraid to experiment and make us think outside the box. Like it or not, you’ll want to see this one through to the end. All in all, Unruly Heroes is just a solid, entertaining platform game. It’s not massively different from anything else and, to be honest, there are better choices on the eShop. However, the way Magic Design Studios have merged several gameplay styles into one and got it to feel so polished is mightily impressive. If you’re looking for a good co-op platformer that’ll make you think, or if you just want to sink your teeth into a new adventure now you’re done with the Hollow Knights and Celestes, then Unruly Heroes is an absolutely gorgeous, well-told, finely crafted adventure that managed to surprise me every step of the way.